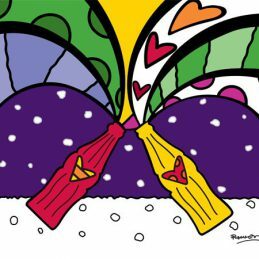 Romero Britto portraits auctioned for over 290k in London! Last night two BRITTO portraits were auctioned off by Lord Harry Domeny from Sotheby’s in London for more than 290k dollars to benefit Richard House Children’s Hospice !!! A huge thank you for John and Amelia Winter and Katherine Davis to coordinate this amazing donation!!! Best Buddies International is a nonprofit 501(c)(3) organization dedicated to establishing a global volunteer movement that creates opportunities for one-to-one friendships, integrated employment and leadership development for people with intellectual and developmental disabilities (IDD). 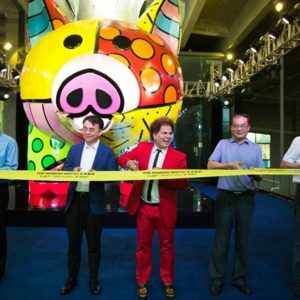 Romero Britto was exhibited at the 11th annual Korean International Art Fair KIAF 2012 held in Seoul, Korea from September 13 – 17. This year 181 galleries from 20 countries participated, and Latin America was the Guest Country of Honor. Gallery BandiTrazos featured Romero Britto amongst domestic and international artists that were exhibited at this global event. Art lovers and collectors from around the world were captivated by Romero’s new original paintings.